I love the German Shepherd - plain and simple. And I'll be the first to admit that I'm very biased about the breed, this is indeed my favorite dog breed. And if you see the letters "GSD", don't be confused as this is simply another name for this dog breed and one that you may see a lot in this site. You might also see Alsatian dog, too, or Alsatian Wolf Dog or maybe even Deutscher Schäferhund - other names often used for this dog breed. If you've come here to see great GSD pictures, to look at the German Shepherd growth chart, or if you're trying to learn more about this super intelligent breed of dog because you're thinking of getting one for yourself, then you've come to the right place. The GSD has a long history of working, even though the dog breed itself is only just over 100 years old. This dog breeds superior intelligence and train-ability combined with a rock solid temperament also makes the GSD a perfect family pet and companion. Click on any image or link below to go right to the section of this site that interests you most. Max von Stephanitz, developer of this breed, envisioned a dog breed of tremendous character, great working ability, utter loyalty as well as high intelligence. He thought that above all "Utility is the true criterion of beauty" and developed the breed with this in mind. Just so you'll know, this is a natural dog breed, unchanged with no additional need of surgical "enhancements" of any type such as ear or tail docking or excessive grooming requirements. Jack of all trades, this dog breed can do it all, and do it all well. It is often said that no other dog can do so many different things as well as a GSD. Several other dog breeds may do one specific task better, but no single dog breed can perform such a wide variety of tasks overall as well as the GSD. Inside this site you'll find some of the best and most detailed information there is available covering all aspects of the GSD - GSD pictures, facts, articles, historical research, news, detailed info on training your GSD, health resources, GSD breed information and more. You'll find it all here. The goal of this Alsatian dog breed site is to provide you the best information available online about all aspects of this fantastic dog breed, frequently called the Alsatian. Additionally, I want to offer you the best tips, dog breed gifts, GSD trivia, articles and health and diet information available online. Having been owned by, lived with, and, at one time, bred these dogs (for well over 35 years) I can honestly tell you that the GSD is the perfect breed of dog for me - however, they are not the perfect dog breed for everyone. Read on, enjoy your visit, and please feel free to contact us any time with any questions that you may have about these wonderful dogs or to share stories and photos with us of your own Alsatian. And that's just the beginning of this dog breeds brave and historic background. And just keep reading - because in the many pages of this site you'll also find loads of health information, training tips and so much more. Here Is Our GSD of the Month - December 2016! Congratulations on becoming our December 2016 German Shepherd of the Month winner! If you love memes, why not check out our new library of German Shepherd meme? If you wish to support this site, then please take a look at the various ways you can help us maintain up to date information on the German Shepherd Dog. Looking for German Shepherd facts? So let me share some of the most important German Shepherd facts right now. What is the difference between a Alsatian and a German Shepherd Dog? Let me assure you that there is no difference. GSD FAQ : German Shepherd Frequently Asked Questions. Click here to learn more about the German Shepherd Dog. Are you looking for German Shepherd Puppies to Adopt? Find the best adoptable GSD puppies available for adoption right now. Now you can search for GSD puppies to adopt in your own area. Welcome to Our German Shepherd Dog of the Month Page - featuring a wonderful picture of our favorite dog breed, the German Shepherd, chosen by a guest judge from this months entries. German Shepherd Names - yes we have 1000's of them. German Shepherd Dog names do require some thought. Check out our GSD name suggestions by clicking here now. Choosing puppy names for your new German Shepherd pup is just one of the first major decisions you will have to make. Read on to view more German Shepherd name choices. GSD training, German Shepherd training can begin with a young puppy and continue through adulthood. Click here to learn more. Feel free to read through our collection of German Shepherd Articles, all grouped by specific subject. 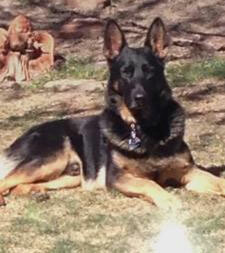 GSDs in the news - Stories from Around the World about German Shepherds in the News. Check this page out to get the latest stories about German Shepherds from all over the world. Looking for German Shepherd Dogs for Adoption? Then you're in luck because you can now look for GSDs and many other adoptable dogs directly from out website. Grooming the GSD: German Shepherd's DO shed... A LOT. Click here to learn how to groom a German Shepherd correctly. If you're looking for Natural Dog Health Supplements, something without all the side effects of so many traditional medicines, please try these choices as a natural alternative. Got a question about the health of your own German Shepherd. Need it answered right now. Then please try our Ask the Vet service. Looking for the Best Dog Vacuum Cleaner? Let me share a list of the Best Pet Hair Vacuums with you here. German Shepherd Ebook? Did you get your "GSD owners manual" ? For a limited time, you can even get our book FREE if you like. "Pay me or Get It Free" - your choice - just get it now before times out! Any German Shepherd owner should have German Shepherd Books in their library. You can get them on care issues, training issues and the history of the GSD too. A Dog DNA Test can easily help you to determine the overall genetic makeup of your pet if you are interested in knowing exactly what your canine really is. Do you need to find dog friendly hotels? There are several steps that a pet owner can take in order to find pet friendly hotels in the area of their vacation destination. Read on to learn more. German Shepherd dogs need Tough Dog Toys. Check out this page to learn about a few of our GSDs favorite dog toys. If you want to view some really nice pieces of German Shepherd Dog Art, then you're in the right place. Enjoy looking at each of these wonderful and affordable works of art. Looking for dog apps for iphone? We have many iphone dog apps - just check for yourself and browse through all our selection of dog iphone apps. Do you know of a great German Shepherd story? Are you dying to tell it? Then welcome to our GSD Story Page! People from all over the world can share a story, truth or fiction. Your choice. Have you ever thought about German Shepherd Tricks? What kind of tricks does your German Shepherd know? How many tricks does it know? Did you teach them the trick? Feel free to read German Shepherd puppy stories shared with us by our readers. Have one of your own you'd like to share? Send it to us today. Looking for German Shepherd puppy pictures? We have plenty. If you want to share your own German Shepherd puppy picture you can even do that here too. We'd love to see them! Do you have a German Shepherd Mix? I'll bet you have seen a GSD mix at one time or another because they are quite common. Read on to learn more. Everyone has their own My Favorite Dog things. Let's share them with each other here. Who knows, you may just find some new favorites just by checking out what others have shared. Do you know of any German Shepherd video footage that should be on this website? Click here to submit those GSD videos now to RooTube! Do You Have Any German Shepherd questions? What about those floppy GSD ears? How do I choose a GSD puppy? If you have a GSD question, then here is the place to ask it! Just how up are you on German Shepherd Movies or movies that have a German Shepherd as a central character. Enjoy looking through the list of German Shepherd stars that we have collected below. GSD-TV, German Shepherd Dog TV. All German Shepherd, All the Time (need I say more). Click here to browse through our selection of beautiful GSD Wallpapers / German Shepherd Wallpapers to download to your own desktop and for your own personal enjoyment. Feel free to view the German Shepherd pictures you will find here anytime.